He wrote a letter to the film director. Crimean activist Oleksandr Kolchenko has written a letter to Ukrainian film director Oleh Sentsov, both were illegally convicted in one and the same case and imprisoned in Russia, rights activist Tatyana Shchur has said, according to Hromadske. She received the letter from Kolchenko's lawyer who visited his client in a colony in Russia's Kopeysk, a town not far from Chelyabinsk. "Today I have learnt that you have dropped anchor (announced a hunger strike – Ed.note). I am very concerned about this circumstance, considering the fact that when we talked, you did not approve of this measure, and given the reports that your health condition in this northern trip has deteriorated," Kolchenko writes. He added that while he was just out of solitary confinement, he was prepared to be sent back there as Day of Russia was looming. "From my sheltered sanatorium, I would like to wish you health and strength which we will need when we are free in Ukraine". According to Shchur, it is a popular practice in Russian prisons to move inmates convicted on grave charges to solitary confinement because of state holidays. "There they are held for around two weeks for prevention. Such are rules, they do it eto everyone," she explained. Sentsov and Kolchenko were detained in Crimea on 10 May 2014, shortly after the Russian annexation of the peninsula. They were accused of plotting terrorist acts. 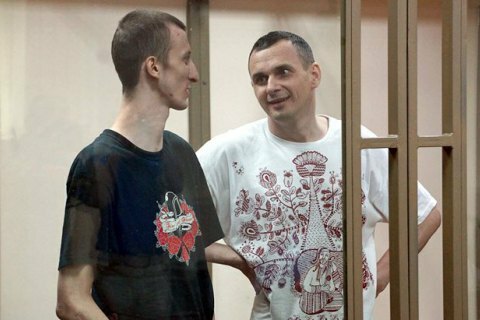 Kolchenko was sentenced to 10 years in prison, Sentsov to 20. Hennadiy Afanasyev and Oleksiy Chyrniy were detained together with them. Afanasyev was exchanged in 2016 and returned to Ukraine, Chyrniy is held in a colony in Magadan.